KVH Industries, Inc., (Nasdaq:KVHI) has announced that the company's longtime satellite capacity partner — SKY Perfect JSAT Corporation (SJC) — has agreed to invest $4.5 million in KVH as part of the two companies’ ongoing commitment to deliver next-generation maritime broadband services — KVH and SJC intend to collaborate on value-added services in the area of shipping digitalization and improved broadband access at sea. 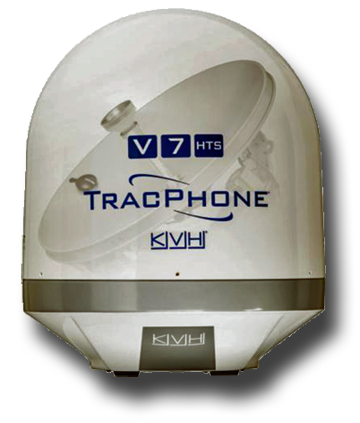 KVH, a mobile tech innovator, recently introduced the TracPhone® V7-HTS, a 60-cm satellite antenna system designed to provide download speeds of up to 10 Mbps and upload speeds of 3 Mbps, enabling vessels to benefit from marine applications designed to improve operational efficiency. This is the latest advancement from KVH, which introduced the first TracPhone VSAT system and the mini-VSAT Broadband service in 2007. KVH first began leasing satellite capacity from SKY Perfect JSAT in 2009 to expand the mini-VSAT Broadband network’s Asia-Pacific and Indian Ocean coverage; today, KVH’s maritime network covers 105 million square miles, making it one of the world’s most extensive maritime networks. Shinji Takada, SJC’s representative Director, President, and CEO, noted that for years, the collaboration of KVH and SJC has developed the Asian shipping market with excellent satellite communications services and this relationship will continue. SJC's investment is based on the firjm's conviction that KVH’s superior technology, equipment, and services are crucial at this time of digitalization in the maritime industry. Martin Kits van Heyningen, KVH’s CEO, added that working together, the companies can leverage the firms' technologies and strengths in order to provide the faster, reliable global connectivity and the value-added services that the maritime industry needs. Note to Editors: For more information about KVH’s maritime connectivity solutions, visit the TracPhone V7-HTS website, at kvh.com/connections. High-resolution images of KVH products are available at the KVH Press Room Image Library, at kvh.com/press-room/image-library.